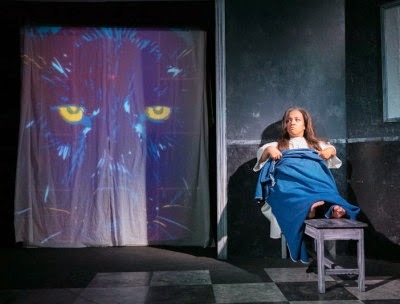 The universal acclaim of Defunk Theatre's production of Stephen Spotswood's electrifying post-modern fairy tale In The Forest, She Grew Fangs has been overwhelming. It was an honor to direct and produce a show this pertinent, magical and raw with a cast so game to travel down every dark and twisting path before us. We are honored to be previewed in American Theatre Magazine's October issue.
" incorporates aspects of Little Red Riding Hood into the story, to show that, unlike in fairy tales, the line between villain and victim are blurry in real life. “Bullies were once bullied themselves. So you can be victim and perpetrator, and a hero, all simultaneously,” the writer says."